For Wellspring Family Services, the boost from The Seattle Times Fund For The Needy in the fundraising campaign’s 40th year was nothing short of remarkable. 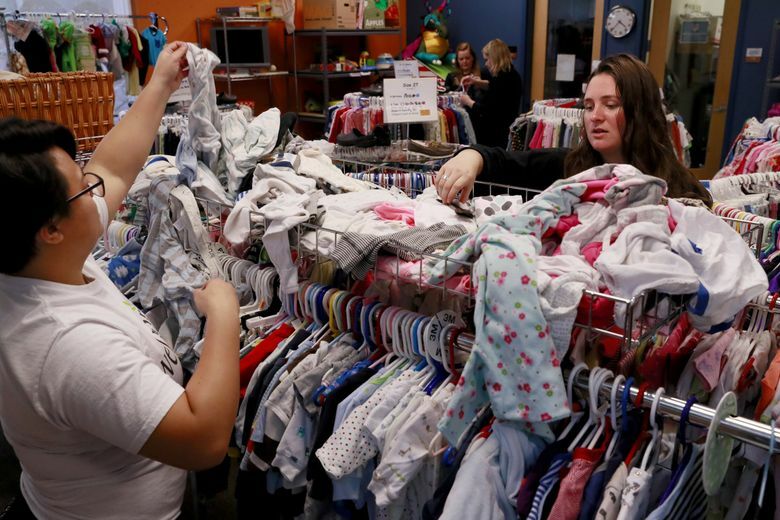 “We had a banner year in donations into our Baby Boutique,” said Wellspring CEO Heather Fitzpatrick, referring to the nonprofit’s shop for free, gently-used clothes and other items for children. And the organization, which focuses on family homelessness and is one of 12 benefiting from the annual holiday-season campaign, had so many donations pour in to its holiday toy store that it shared the bounty with other organizations. Fitzpatrick credits a Times story, about a mother who battled drug addiction and survived two abusive relationships, with bringing in those donations on top of the money received from the fund. The story put a human face on family homelessness, Fitzpatrick said. Seattle Times Publisher Frank Blethen and President Alan Fisco said they also saw the power of storytelling in this year’s results – $1.48 million raised from 3,768 donors. Through stories about each organization after the campaign’s kickoff in November, “our readers got a taste of the great work being done,” Fisco said. They showed how organizations provided desperately needed support. Hopelink, for instance, helped the mother of three children, including one with a genetic abnormality that made her prone to seizures, avoid homelessness. Treehouse served as a steady presence in the life of a foster child short on people she could count on, and the organization continued its support as she struggled in college. Money from the Fund For The Needy will go, in part, toward helping Treehouse expand its work with foster children as they enter adulthood and strive for college degrees and professional certificates, said Treehouse CEO Janis Avery. All fund donations given to Hopelink, which helps stabilize families in economic distress, go directly to keeping clients housed, fed and warm, Thomas said. The Times covers all costs associated with the fund, so the money can be used for people who need it. Though the amount raised fell shy of a $1.6 million goal set by the paper, this year’s campaign inspired donors big and small. Argosy Cruises, which has given to the fund for more than 20 years, contributed $38,000. Pacific Northwest Ballet, which had in previous holiday seasons participated in food and toy drives, decided for the first time this year to use the fund as its primary outlet for charity. “It felt like a really easy way, and an important way, to give back,” said marketing and communications director Lia Chiarelli. A portion of ticket sales for the opening performance of The Nutcracker went toward the ballet’s donation – raising just over $19,000 for the fund. The opening was also a benefit for the ballet company’s school. “The whole evening had a special give-back vibe,” Chiarelli said. Glenn Wilhite said he and partner Karin Besaw saw the fund as a way to simplify their giving after retirement. When they were employed, he as a driving instructor, she as a data analyst, they used to contribute to charities through payroll deductions. They set up something similar with the fund; an automatic deduction of $100 comes out of their joint bank account every month. Giving is a Christmas Eve tradition for Pat Limberg and a group of friends who gather for a potluck. “We’ve reached a point in our lives where we don’t need more stuff,” she said. So instead of exchanging gifts, they each chip in $10 to be given away. A drawing determines who decides where the money goes. “I won this year!” Limberg said, and so did the Fund For The Needy, which netted $120.